Discussion in 'Off-Topic Discussion' started by SlvrSlug, Jun 19, 2018. Just trying to get the word out over here, i already posted over there on the warning i got when trying to log on from my desktop. When i tried to log on it said to have then secure the site, i do not get this from my i-pad, only the desktop. The little lock has a red line through it, so i logged in here and the lock was green, and no warning. Weird. I have superspyware, malwarebytes, minerblock and, ugh, mcafee running. I logged out when I saw your warning. Just tried to log back in and got no warning bells and whistles. I wonder what is going on with them? I didn't notice anything posted by admin over there (shocker, right, lol). Weird. I'm not super computer savvy but I'd be worried about that. I've logged out just to be safe. I wouldn't be surprised if they were compromised. They apparently knocked the spam stuff out, but the Russkies might have found another way in, lol. Firefox (the browser you appear to be running) currently warns about unsafe sites. Google Chrome will start giving the same warning about unsafe sites next month. Apple began giving that warning for unsafe sites since the iOS 11.3 update (maybe your iPad is running an older version?). tackleberry1145 and Bob like this. Soooo.....what makes a site "unsafe"? 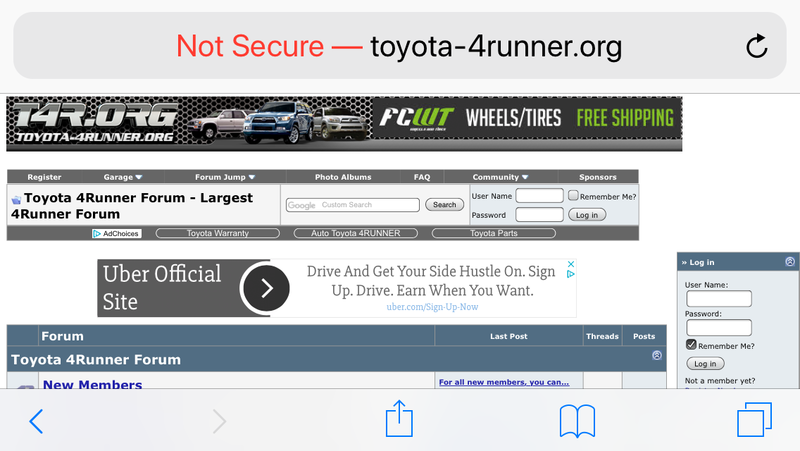 Long version: You see in the address bar of the unsafe sites that the address begins with http, and safe sites begin with https? Well sites that support https ensure that any info you send between your computer/phone/tablet and the site's server is encrypted in transit, so the information can't be snooped on by someone along the network route. When you type your username/password into an unsafe site, that information is traveling across the internet in the clear, unencrypted, so any network operator in the middle could potentially grab it. There's even a name for that attack. It's called a Man In The Middle attack. And a lot of folks use the same password for multiple sites, so you can see how that's dangerous to have it flying in the clear. Sites that have https setup properly get a cool green padlock in the address bar to let you know that any info you send, including your login, is encrypted as it travels the Internet to its destination, the website you're visiting. This is a simplified explanation because there's lots of nuance, but that's the gist of it and many of the major tech companies (Apple, Google, Mozilla, Microsoft) think it's important enough that you should be warned when a site doesn't utilize https encryption. Daria, 4WALKER, tackleberry1145 and 6 others like this. I think the most likely circumstance is that the security certificate for that other site whose name I won't mention expired. Thanks for taking the time Bob, you guys do a great job over here, kudos. Looks like my post on the warning was deleted at T4R.ORG, i guess i am a trouble maker, sorry guys. Backslider and tackleberry1145 like this. Thanks Bob! I appreciate you taking the time to help me (and apparently us, lol) understand! LoL....and this evening Chrome is advising that it is "not secure" and I shouldn't enter any sensitive information on the site. I am not very tech savvy, so i do not know how sensitive this is, but i do not think they should have deleted my thread reporting it, just sayin. Maybe it was kind of like them telling people if they saw spam more than X minutes old to not report it? My thought was perhaps they should have fixed the ongoing spam issue and people wouldn't have to waste time reporting it, lol. It's still showing unsecure. Nice. I was browsing today and saw what appeared to be 2 site staff busting a posters balls that had asked a question about the classifieds and thought to myself....self, not sure why you come here if this is how new folks get treated.